We used hydroponic experiments to examine the effects of different concentrations of lead (Pb) on the performance of the Pb-tolerable plant Conyza canadensis. In these experiments, most of the Pb was accumulated in the roots; there was very little Pb accumulated in stems and leaves. C. canadensis is able to take up significant amounts of Pb whilst greatly restricting its transportation to specific parts of the aboveground biomass. High Pb concentrations inhibited plant growth, increased membrane permeability, elevated antioxidant enzyme activity in roots, and caused a significant increase in root H2O2 and malondialdehyde content. Analysis of Pb content at the subcellular level showed that most Pb was associated with the cell wall fraction, followed by the nucleus-rich fraction, and with a minority present in the mitochondrial and soluble fractions. 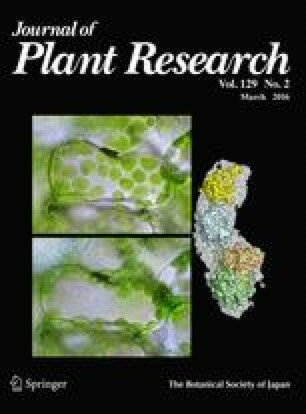 Furthermore, transmission electron microscopy and energy dispersive X-ray analysis of root cells revealed that the cell wall and intercellular space in C. canadensis roots are the main locations of Pb accumulation. Additionally, high Pb concentrations adversely affected the cellular structure of C. canadensis roots. The increased enzyme activity suggests that the antioxidant system may play an important role in eliminating or alleviating Pb toxicity in C. canadensis roots. However, the levels of non-protein sulfhydryl compounds, glutathione, and phytochelatin did not significantly change in either the roots or leaves under Pb-contaminated treatments. Our results provide strong evidence that cell walls restrict Pb uptake into the root and act as an important barrier protecting root cells, while demonstrating that antioxidant enzyme levels are correlated with Pb exposure. These findings demonstrate the roles played by these detoxification mechanisms in supporting Pb tolerance in C. canadensis. Ying Li and Chuifan Zhou contributed equally to this study. This work was supported by Research project of forestry public welfare industry of the State Forestry Bureau of China (201304303), Foundation for Cultivation plan of Distinguished Young Scholars of Fujian Province, National Natural Science Foundation of China (31400465, 41401364), and Major projects of agricultural science and technology cooperation in Agricultural University (2013N5002).